Sapphire crystal with luminous hands and hour markers. Watch is water resistant to 20 ATM. Tegimented black bracelet. Verified Owner Comments: I have been wearing this watch 24/7 since I bought it this month. It goes with me to the shower, desk diving on my laptop, hiking, rubbing it back and forth my keyboard. My laptop itself is coated black and due to the bracelet, it has worn of the coating on the laptop. But on the bracelet itself, it is as good as new. However, I was surprised to find that the Watch dial's pvd coating has slightly worn off and showing the tegimented grey. 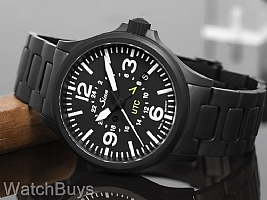 I have no personal qualms with this, as I like that it shows that it has been worn and beaten and used, however, I had the impression that the PVD coating on Sinn watches are very durable and would withstand a lot more abuse. Overall, I love it, but I did have the impression that the PVD coating would last longer than 3 to 4 weeks of continual wear. "Love the watch but it has minor flaws"
"Great looking and very functional watch"